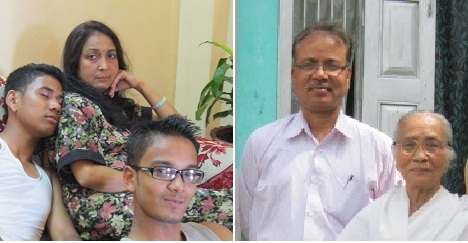 Years passed and now I am blessed with two sons, the elder one has recently left home to join his service. Our son is now undergoing vigorous training and he gets opportunity to call us only in the Sunday afternoons. My wife in Guwahati, Assam and I in Sikar, Rajasthan wait eagerly for that particular time of the week to hear his voice. As a part of their training, few days ago, my son was taken for some kind of camp which, we heard, was to be highly demanding both physically and mentally. My wife could not eat and sleep properly all these days constantly worrying about our son. She being a kidney patient herself, her condition became worse. She was not even willing to talk to anyone over phone including me. This afternoon, the phone rang. It was my son calling. I asked whether he had already called his mother back home. He answered positively..After his call I called back home and as expected my wife was full of enthusiasm, the chest pain she had developed since last Tuesday was gone after getting to hear her son’s voice over phone…. I went out for my evening walk and suddenly remembered what my mother used to tell me, how much a child means to its parent. I reached for my mobile, dialed my mother’s number, as expected she was very very happy… it was just a phone call. :-) Yes. Thank Allah million times for such loving and doting mothers. They make life beautiful, and meaningful.